Join us for the Victorian Launch of World AIDS Day 2018. Launched by Peter Breadon, Executive Director, Community Participation, Health and Wellbeing Division Department of Health and Human Services. Keynote Speaker: Professor Mark Stoovè – Head of the Public Health Discipline, co-Head of the HIV Elimination Program. Burnet Institute. Living Positive Victoria speakers: Dr Susan Paxton and Julien Fournier. Join our special panel moderated by Dr Chris Lemoh, President of the Victorian African Health Action Network and Physician. 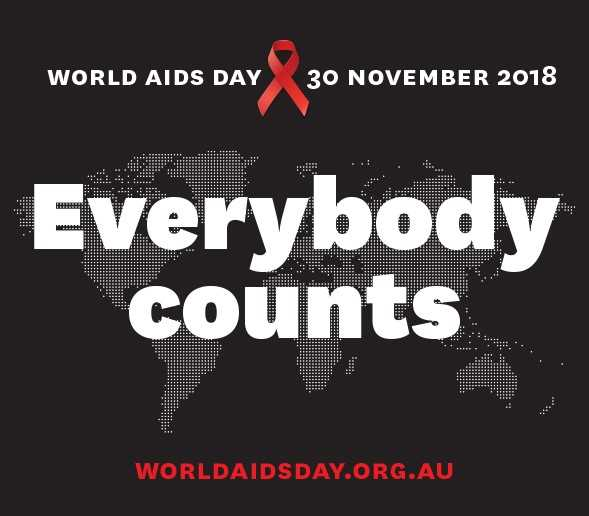 Panel featuring Dr Clovis Palmer – Head, Palmer Laboratory Burnet Institute, Dr Liz Crock – Bolton Clarke Clinical Nurse Consultant/Team Coordinator, David Menadue OAM – HIV activist and Bev Greet – HIV activist. Keynote speaker: Associate Professor Peter Hunt. University of California. Clinical and community perspectives and awards Living with HIV perspective: David Menadue and Heather Ellis. Positive Speakers Bureau. Please REGISTER separately to this session.